I feel that Geoffrey Scovill kept going in new directions. In the first book he was smart and physically strong and good at his work—with a bit of a sarcastic sense of humor. And obviously a yearning for Joanna. In the second book, he was up against more obstacles, not just in his relationship with Joanna but in other parts of his life. I found I was writing him as still highly competent but jealous, strident, lonely, wistful. He’s more complex. And perhaps in response I’ve gotten this outpourings of emails: “Oh, be nicer to Geoffrey! I care so much about Geoffrey!” I feel that I am deepening his character, making him more than just a traditional “leading man.” From what I can tell, the readers like it, but at the same time they’re suffering! 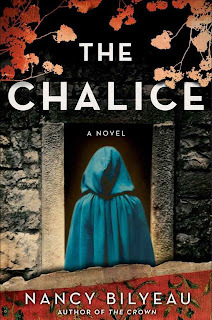 The Chalice is your second novel featuring Joanna Stafford. (The first is The Crown.) Had you intended to write a series when you began Joanna's story? Not when I began. I was just trying to figure out how to develop a plot and craft characters. But by the time I was revising and workshopping the final manuscript my mind jumped ahead and I started coming up with new storylines for Joanna. I have a lot of ideas for her. The Staffords are a real life family; is Joanna based on a historical Stafford? No. I based her upbringing and to some degree for worldview on what the Staffords lives were like in the first part of the 16th century. But there is no female Stafford who I am aware of that became a nun. There are “real” Stafford women who are pretty interesting: One of the sisters of the Duke of Buckingham is thought to have had an affair with Henry VIII when he was in the first years of his marriage to Catherine of Aragon and she was married to a nobleman. When scandal erupted, her husband and brother sent her to a nunnery for a while. That’s as close as anyone came to becoming a nun. The daughter of the duke of Buckingham, Elizabeth, married the abusive duke of Norfolk and had one of the unhappiest marriages of the entire 16th century. She appears briefly in both books. I may have based some of Joanna’s headstrong personality on reports that Elizabeth stood up to her husband and fought back. On your website, you explain why you chose a nun for this era (rather than a royal). Why did you pick this era to write about? It’s always been my favorite century to read about: lots of vivid personalities and dramatic events. So I have a base of knowledge to build on when I write my novels. My husband groans when I bring home a new book on the Tudor era but I can’t be stopped. It’s an addiction. Yes! I am on a real winning streak. I read Michael Penn’s Winter King, a nonfiction book about the reign of Henry VII and the transition period when Henry VIII was a young king. The prose is really first-rate. I can’t recommend it enough. I just finished a real page-turner, Andrew Pyper’s The Demonologist, about how a Columbia University professor who is an expert in Milton and Paradise Lost has to try to save his daughter using that knowledge. It was scary! Learn more about Nancy Bilyeau and her books at her website and connect with her on Facebook and Twitter. 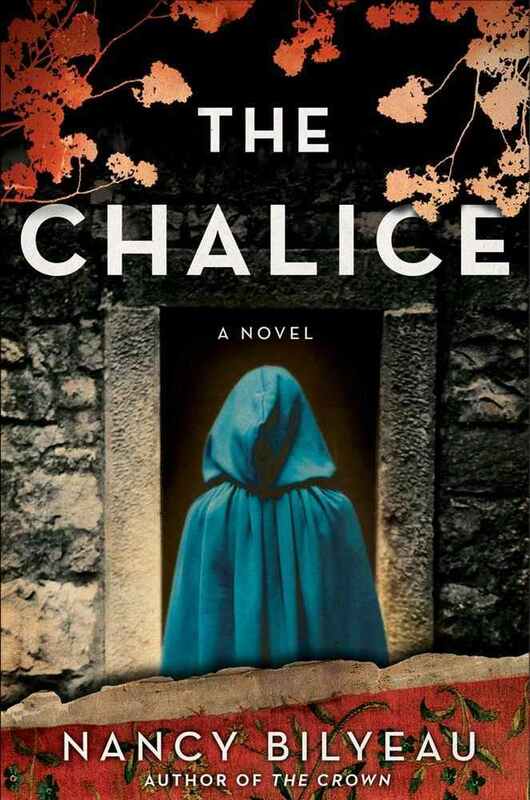 I'm thrilled to offer a copy of The Chalice to one lucky reader! To enter, fill out this brief form. Open to US readers only, ends 4/26. Me too -- I'm definitely not in need of one more series but this one is SO WORTH IT. that Geoffrey -- yum! Great questions, Audra, and the answers are awesome to have. I wondered about the Staffords, and loved how well Nancy blended in all her additions to the story. Good to read about Geoffrey, too. I'm so fascinated by the historical/fictional marriage in this series -- Bilyeau is so good -- am in love. And being in the Geoffrey camp as well, I'm happy too!! I loved this interview, and some of the questions that you asked her are ones that I would have asked her myself! It's so interesting to me how someone can develop a character based on a melding of lots of different people, and even imaginings of people. I, too, wondered if Joanna was based on a real Stafford. I can't wait to get started with this book. It sounds like a blast, and I am eager to see where Joanna goes next. Joanna is so fascinating -- more so seeing that Bilyeau really got creative with her! I think Joanna might be in my top ten favorite heroines. I enjoyed this interview and making a note of Winter King! Great interview. On your recommendation, I already have The Crown on the way!